Spring pressure connectors that reduce installation time by up to 50 percent compared to screw terminals will be among WAGO’s products targeting electrical installers on Stand E92 at the first Elex show of 2017 at Alexandra Palace, London, 1-2 February. 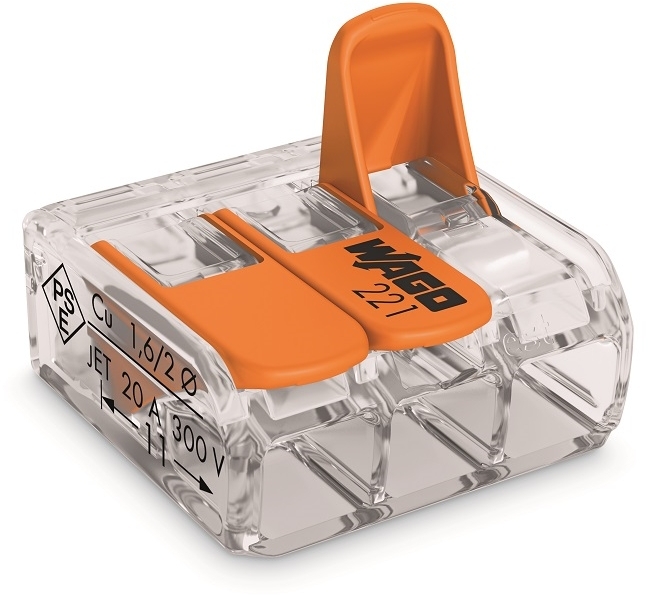 WAGO will be demonstrating its extensive installer offering such as the 221 Series compact lever connector, which not only cuts installation time in half, but at 40 percent smaller than previous generations enables more connections to be terminated in even smaller spaces. Also on show will be WAGO’s full range of tool-free push-wire connectors, spring pressure connectors and compact lighting connectors, including related accessories. As well as installer connectors, WAGO will also be showing its TOPJOB S DIN rail-mounted terminal blocks. Up to 30 percent smaller than its rivals, TOPJOB S offers push-in connection of conductors from 0.5mm² to 16mm2 and connection of stripped, solid, stranded and fine-stranded with ferrules. It is ideal for connecting devices in harsh environments from offshore platforms to hazardous atmospheres in the chemical industry. Also on the stand will be WINSTA, WAGO’s award-winning modular wiring system, which dramatically reduces installation time and reduces on-site skilled labour requirements through the use of pre-assembled pluggable connectors.